We all know what happens when your expectations outperform reality. Enjoy the opposite: 7 cases when reality knocks down the expectations. Let's see how it can be put into practice. A man breaks a part of the pocket clip of his Kershaw knife. He reports of the problem without any hope for feedback. One more happy customer sharing an amazing story among his friends and in social media. Needless to say, since then he's become their repeat customer. A woman enters the store to buy a pair of shoes for her baby. She is sure it’s just a routine shopping, nothing special. A shop assistant pays attention that the child’s feet are wet during trying on so she asks a mother what kind of socks he usually wears. The customer replies and the shop assistant offers her those which would to her mind fit best and help to solve this problem. The mother leaves with 3 pairs of socks grateful for advice. Her admiration increases when she finds out that the seller was right and the problem is solved now. The client has not only bought what he wanted, her extra-problem was solved. She was up-sold without noticing it and became a passionate follower of the brand instead. A man has to shift to another type of shampoo, the one for a dry hair. He knows nothing of the product so he's shuddering in advance as he's afraid to be urged by a seller into buying something he won't need. The shop assistant surprises him. No overloading with extra-purchases, just a professional consultation disclosing all the nuances of dry shampoos. Moreover, as a client has never used it, he offers him a mini traveller’s package instead, just for him to try and see whether it’s Ok. The client is so impressed that in a couple of days comes back for a standard version of shampoo. The client got a most pleasant experience of buying a new product after a professional consultation. And though it seems that the consultant sold less, yet it was like a trial period after which the satisfied customer comes to make a standard purchase and maybe even more, who knows. A little girl just couldn’t get it why the bread looking like giraffe was called “tiger bread”. She wrote a letter to the owner of the company with this question asking to rename it. Who would listen if I ask to change something? I’m too small and insignificant. They agree. They find this idea smart, reply to her and officially change the name of this type of the bread. The client feels the top of the world and this story is virally spread all around. The company makes an ad on the bread about it which states that its title was changed according to the customer's request. The importance of it is hard to overestimate. A boy loses a figure of his Ninjago Jay ZX while going shopping with his father. He writes a letter to Lego company asking if they can send him one more. He promises that this time he’ll take care of it and will never take it to a shop with him. Nothing’s going to happen. The letter won’t reach them, it will be lost. Even if it’s not lost they will pay no attention to it. They don’t send him 1 Ninjago Jay ZX. They send him 2 instead. One more figure is just in case he’ll lose it again. Moreover, they compiled a letter as if it has been written by the Master Sensei Wu. Imagine his delight! Then double it and you might get the pale idea of how it really was! The story is a perfect example of "word-of-mouth marketing" as it demonstrated the personalized approach which raised their brand to a new higher level of commitment. The boy is about to stay at the hospital on holidays and miss a release of his favourite game Halo by Bungie Studios. The disappointed father writes to Bungie Studios just to please his son. He doesn't expect much taking into account the circumstances. It is more like a letter to Santa. Still, the Santa appears! The whole studio writes and signs "get well card" for a boy. More than that, they design a custom helmet based off the main character for a boy and sends it along with toys, shirts and other gifts from the designers of the game. If happiness exists, that's when it was the brightest! The company displays the compassion and care in a hard situation which is appreciated so much by the people. This case increases their customers' loyalty and now even if the company screws up anything it will be perceived much easier. The famous speaker and founder of HARO and 5-time authour made a light-hearted tweet sitting on a plane. He was hungry and asked Morton's Steakhouse if they can deliver him a steak upon his arrival. It was rather a joke so he didn't give it a second thought in half an hour. He was shocked though seeing Morton's representative in tuxedo meeting him at the terminal with a full meal including a steak. 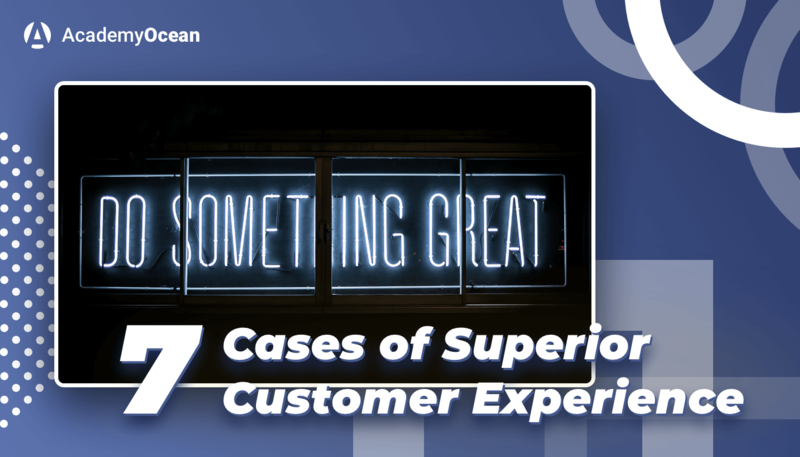 The story which was meant to be a joke converted into one of the most spread stories of top-notch cases of customer service. The last point is especially important for smooth customer experience of your clients. This is one of the reasons we created AcademyOcean. We want to help companies educate their staff, users, clients and anyone interested in their product or service. We strongly believe that with interesting and properly structured Academy any company can boost their marketing and customer experience to new levels.